What many don’t realise before they leave home is that in Australia they too have to work, often a lot harder than they ever did in Europe. We should know as we have been there and done that. While we can attest to the fact that Australia is an amazing country that offers a lot of opportunities for newcomers, it can also be a very lonely place when the rest of your family is still living on the other side of the world. However, despite the good and the bad we would never trade places again and go back to Europe. We have made our mark here in Australia and love our newfound freedom (in a different way) and now enjoy the food, the weather, the land, the animals, the lifestyle, the coffee (yes Aussies know how to make the best coffee in the world), and the space that surrounds us. Moving to Australia in search of property bliss is actually a reality for Brits who have enough of a nest egg. While they also have to fork out more and more money for a home in the sun, properties are in general much more affordable than back in the UK. Not to forget the space you are getting for your money. However, Australia too is starting to show signs of the global credit crunch with many companies going bust or down-sizing their operations. If you are lucky enough to be able to migrate to Australia, then now is a good time to buy property – if you are prepared to stick it out for the time being as capital appreciation is expected to take years due to the weak economy. Also, with the recent drop of the British pound against the Australian dollar British expats haven’t got the same buying power anymore. Even so, their money still buys good in Australia. Many properties have fallen in price offering buyers many opportunities for future appreciation. But if you are thousands of miles away you probably wonder where to buy anyway. The following is a little overview on the current market of the major cities around Australia. Brisbane has always been a favourite with British expats as they are drawn to the sunshine and the beaches. As the state’s capital, Brisbane offers a contemporary lifestyle to new settlers with the added bonus of being close to both the water (islands) and the lush hinterland. Property prices have skyrocketed in recent years thanks to a booming mining industry and tourism. If you are prepared to go rural or live on the city’s outskirts you can still pick up a good bargain these days, especially now that prices have started to crash again. Many mining companies are forced to sack their employees as the economy takes its toll on their operations. This is starting to take a rippling effect through the communities of Queensland. Western Australia has huge reserves of natural resources such as gold, bauxite, oil and iron resulting in a mining boom at the beginning of the millennium. This demanded a huge influx of professionals and where better to look than Britain. Therefore Perth became the number one hot spot for expat Brits who were often sponsored right from the horses mouth. While many feel a little isolated in Western Australia due to being miles from anywhere, the lifestyle and localities make up for it for sure. But after the housing boom of the early millennium reality has settled in and house prices are falling. Last year they fell by 3.4 % and are expected to continue. For British migrates this means that £300,000 to £400,000 will buy them a lovely property with plenty of space and privacy on the outskirts of Perth. Also known as the city with 4 seasons in one day, Melbourne offers a sophisticated lifestyle with an European feel. Many ethnic groups have made Melbourne their home and expats can enjoy a combination of great art, culture, wilderness (on the city’s outskirts), fabulous shopping and everything else one would want after migrating from the UK. While the Melbourne flat market is known to be oversupplied and volatile, currently there are opportunities as prices have hit a plateau. If you are a type that enjoys a bit of everything, then Melbourne is the place for you. Adelaide is charming, affordable and offers some of the best wineries in the country. It also offers some of the country’s cheapest property market compared to other big cities. However, Adelaide has experienced a huge surge in price appreciation in the last 5 years or so, thanks to the world’s biggest uranium deposit. It is conveniently located to both beaches and the Barossa valley, the infamous home to many wineries. Expats usually don’t choose Adelaide as their first port of call when they move to Australia. However, this fact offers many opportunities for work sponsorship visas since the city tends to lose its locals who are keen to move to places like Sydney or Melbourne. However, having lived in South Australia we can vouch for the simple beauty of Adelaide and the lifestyle that comes with it. 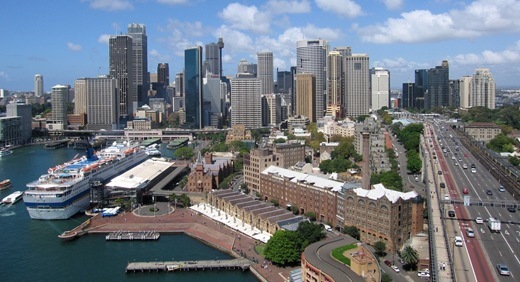 Sydney has always attracted a large number of British migrants. For many, the harbour city epitomizes the Australian dream. There is certainly beauty in the eye of the beholder. Bobbing boats in the harbour jostle for spaces with the rays of the sun while people flock to the area of the Rocks to enjoy a cold beer with their mates. Yes, life in Sydney is kind of cool but we also think it is highly over rated. Plus you have to deal with traffic jams, horrendous property prices and overpriced food and drinks. Unless you are a millionaire, Sydney is out of bounds. Plus you’d have to be crazy to want to pay much as £50 a week in tolls to negotiate the maze of new tunnels and highways on your way to work. You might as well stay in London to do the same. It is clear that Sydney’s property prices are the most expensive in the whole country. With a median house price of £257,000 not many can afford to buy within the reaches of the city anymore. However, there are some good buys near the beach. A small two-bedroom apartment can be had for around £245,000. As with almost every market worldwide, buying property in one of Australia’s major cities will have you dig deeper into your pockets. Go further afield and you can still find good deals that make your pound last longer.